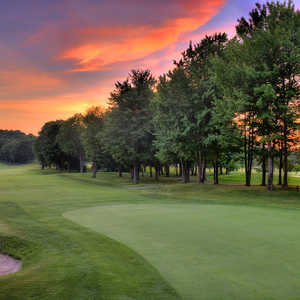 Michigan has so many good public courses that Golf Magazine and Golf Digest just can't seem to decide which ones are most worthy of top 100 status. The 18th at Pilgrim's Run Golf Club is regarded as one of the most exciting in the region. The two national magazines do agree on one thing: Arcadia Bluffs Golf Club, Forest Dunes Golf Club in Roscommon, Tullymore Golf Club in Stanwood and Bay Harbor set the standard for public golf in Michigan, consistently ranking all four in their top 100 lists. Beyond that, it's a free-for-all. Golf Magazine included the Greywalls Course at Marquette Golf Club among its "Top 100 You Can Play" in 2012, while Golf Digest's most recent "America's 100 Greatest Public Courses" released in February 2013 opted instead for Black Lake Golf Club in Onaway; Heather Course at Boyne Highlands Resort in Harbor Springs; Elk Ridge Golf Club in Atlanta; and The Bear at Grand Traverse Resort & Spa in Acme. That adds up to nine "top 100" courses. Treetops' Fazio Premiere Course and The Masterpiece by Robert Trent Jones Sr. are just as good as the Signature, but the resort has made a commitment this year to make this Rick Smith course its premier attraction. Known for its vistas from elevated tees, the Signature will get special attention from the greens staff, such as walk-mowing the tees and greens. "There will just be a variety of things we do to make it stand out and give it the recognition it deserves," Treetops General Manager Barry Owens said. It's ironic that TimberStone regularly gets rated a five-star course by Golf Digest's "places to play" reviews, but the magazine won't give it such lofty status in the top 100. TimberStone, located in the Upper Peninsula, will forever be the legacy of Michigan's own Jerry Matthews, who has done more courses in the Wolverine state than anyone. The layout rips down the Pine Mountain ski hill for its final two holes, the par-3 17th and par-5 18th. This Paul Albanese design, part of the Island Resort & Casino just west of Escanaba, will host its third LPGA Tour Futures event in June. Sweetgrass provides a sharp contrast to most other U.P. courses. Instead of the wooded corridors that characterize TimberStone, wide fairways in a meadow setting maintain an open feel at Sweetgrass. An island green at No. 15 adds drama. The best two holes are the par 5s at No. 9 and No. 18, separated by a water hazard with multiple waterfalls. Pilgrim's Run has been selected among the nation's top 100 before, but newer courses have bumped it out. The 7,093-yard course can test top players (it has hosted a U.S. Open qualifier) and still allow hackers to enjoy their day. The back story of Pilgrim's Run is quite unique. Then-superintendent Kris Shumaker created the routing, while six employees of the founder's company designed three holes each within the guidelines provided. Architect Mike DeVries designed the green complexes and did some consulting. What resulted is a Michigan masterpiece. The Gailes, which bounces in and out of the top 100, pulls off a "links" look better than most in the United States. Some sodwall bunkers and plateau greens create quite a challenge, especially if the wind blows off the lake. Full disclosure: My only hole-in-one has come courtesy of the Gailes. If I can conquer it, so can you. 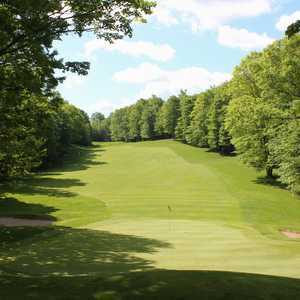 (Battle Creek) and Moose Ridge (South Lyon) are all excellent courses, reasonable to play challenging and well maintained. In Michigan, we have it good. Too good, in fact. More great courses than there are Saturdays in a season. 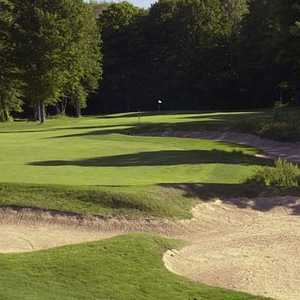 Beyond the courses mentioned, consider all of the sister courses at Boyne, Treetops and GTR. Add four courses at Shanty Creek (Cedar River and The Legend, for sure!) plus Eagle Eye (good call, John), Pilgrim's Run, Kingsley Club, Pilgrim's Run, and Red Hawk. And I know there are plenty I've forgotten here. Michigan's must play list is pretty awesome. I agree. There are too many good candidates for out-of-staters to visit just once. The Gailes? Seriously? All chrome and no soul. It is a links course only because they followed a checklist: double green? check. redan? check. And you can't see the lake at any point. It gets high marks only because so many have played it thanks to the way they cater to outings and buddy trips. Much better choices for your list are Bedford Valley, the University of Michigan course (a MacKenzie design), Shepherd's Hollow, Eagle Eye, Yarrow, The Grande, or Angels Crossing. John, U-M is not a public course, but certainly among the favorites in the state. Eagle Eye could easily be on this list, as could Shepherd's Hollow and Yarrow. The others are a half-step behind, either in service, facilities or conditions. No one has ever asked at U-M for my affiliation. Ditto MSU's Forest Akers. Might as well be public.